Some medical conditions may interact with Biaxin. Use Biaxin as directed by your doctor. Check the label on the medicine for exact dosing instructions. • Take Biaxin by mouth with or without food. • Biaxin works best if it is taken at the same time each day. • Continue to take Biaxin even if you feel well. Do not miss any doses. • Do not miss any doses. If you miss a dose of Biaxin , take it as soon as possible. If it is almost time for your next dose, skip the missed dose and go back to your regular dosing schedule. Do not take 2 doses at once. • Biaxin only works against bacteria; it does not treat viral infections (eg, the common cold). 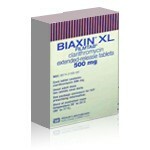 • Long-term or repeated use of Biaxin may cause a second infection. Tell your doctor if signs of a second infection occur. Your medicine may need to be changed to treat this. • Be sure to use Biaxin for the full course of treatment. If you do not, the medicine may not clear up your infection completely. The bacteria could also become less sensitive to this or other medicines. This could make the infection harder to treat in the future. • Lab tests, including complete blood counts, may be performed while you use Biaxin . These tests may be used to monitor your condition or check for side effects. Be sure to keep all doctor and lab appointments. • Biaxin should not be used in CHILDREN younger than 6 months old; safety and effectiveness in these children have not been confirmed. • PREGNANCY and BREAST-FEEDING: This medicine has been shown to cause harm to the fetus. Biaxin is not recommended for use during pregnancy except when no other antibiotics can be used. If you think you may be pregnant, contact your doctor. You will need to discuss the benefits and risks of using Biaxin while you are pregnant. It is not known if Biaxin is found in breast milk. If you are or will be breast-feeding while you use Biaxin , check with your doctor. Discuss any possible risks to your baby. • Abnormal taste; diarrhea; headache; indigestion; nausea; stomach discomfort; vomiting. • Severe allergic reactions (rash; hives; itching; difficulty breathing; tightness in the chest; swelling of the mouth, face, lips, or tongue); bloody stools; confusion; decreased urination; depression; emotional or mood changes; hallucinations; nightmares; severe diarrhea; severe stomach pain/cramps; trouble sleeping. Store Biaxin at room temperature between 68 and 77 degrees F (20 and 25 degrees C) in a well-closed container. Store away from light, heat, and moisture. Do not store in the bathroom. Keep Biaxin out of the reach of children and away from pets.